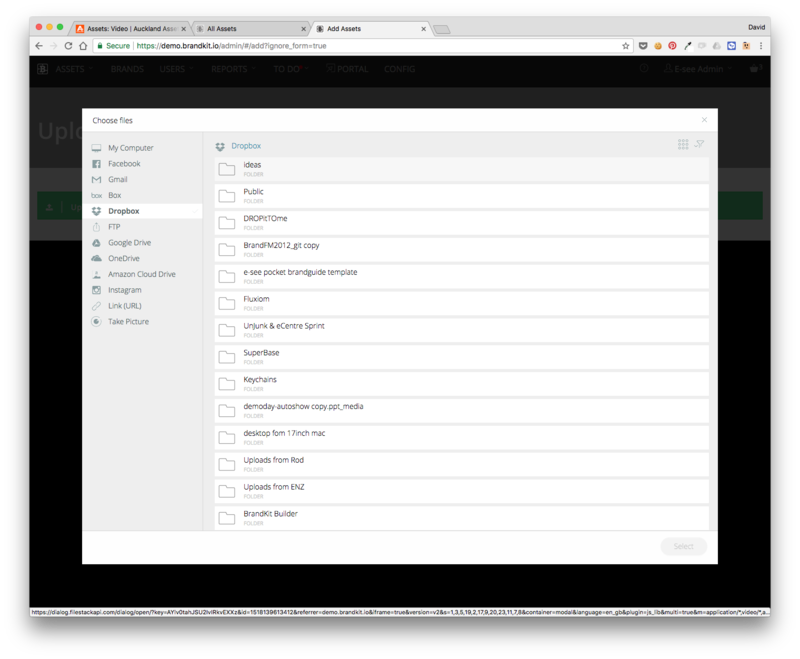 To upload files, you need to be logged in to the Brandkit app (not the Portal) as an Admin user. If you're viewing the Portal, you can navigate to the App from the portal by clicking the spanner icon to the right on the main menu. Click Assets in the main nav to display the Assets dropdown menu and select Fast Upload or click the Upload button in the bottom of the Asset grid. A Drag and Drop window will appear. Drag your files from your computer to the Upload window or click Select Files. Wait for the upload to complete, then click Ok see my assets. The Assets will be Unapproved by default. When Unapproved assets cannot appear in the Portal. Edit the Asset's metadata, tag and approve it, to make it ready for sharing. The not quite as fast way - for batch uploads and when you want Watermarks. Complete the Batch metadata form - this will apply all the data you enter here to all the files you upload with the method. Next decide if you want a Watermark applied to the image (a Watermark must be pre-configured for your account - contact Brandkit Support). The Assets will be Unapproved by default. Edit the Asset's metadata (note that some meta data, AI auto tags and any tags entered in the form, will already be added to the Assets in this batch) , tag and approve it, to make it ready for sharing. You can upload diretly from services like Dropbox, Box, Google Drive, One Drive, etc by connecting and authenticating your relevant account. You'll need a hostname url, a username and a password. You can upload an image with just the image address URL. Pick the Link (URL) option in the upload dialogue and paste your URL.